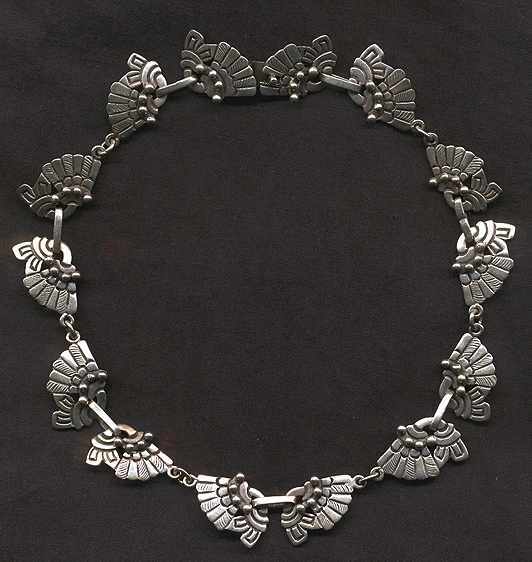 Ana Nunez de Brilanti is one of the original Taxco Silver designers from the late 1930's. She has always been respected for the originality and clarity of her designs and the quality of her work. Her original shop , Victoria, opened in 1940 and closed in 1975. From 1958 to 1975 she also issued her designs as Victoria/Cony and since 1975 she continued to issue her original designs from her daughter's shop, Cony under the mark of Cony. On November 6, 1999, our dear Mistress of Taxco, Ana Nunez de Brilanti, passed away, leaving a legacy of Artistic Works and a large and loving family. Ana will always be remembered for her integrity in Art and her Love of fine design! * Click on thumbnails for full image. 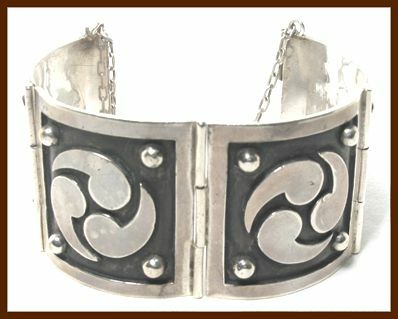 VICTORIA VINTAGE STERLING SILVER BRACELET, c. 1940s. pre-Eagle. 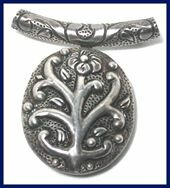 Lovely old handmade design with the links have impressed flower petals and dots. 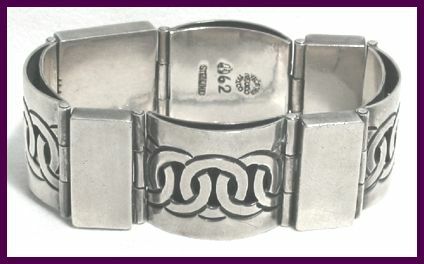 Marked with the early linear Victoria, Taxco, Sterling mark, design #68, Made in Mexico. 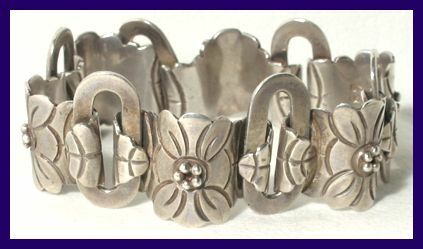 VICTORIA VINTAGE STERLING SILVER BRACELET. c. 1940s, pre-Eagle. A lovely interplay of the Mayan quotation symbol spinning in beds of niello, with domed accent points. Handmade, with the old style pin closure. 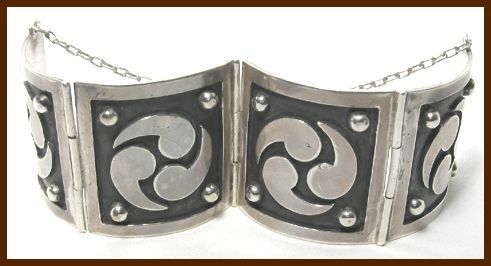 Marked with the circular Victoria, Taxco, Sterling mark, design #66, Made in Mexico. 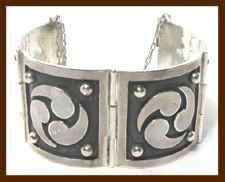 This heavy bracelet measures a substantial 7" x 1-7/8". Very Good Condition, with a few of the domes dented. 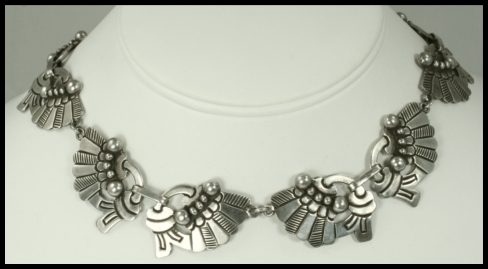 VICTORIA VINTAGE STERLING SILVER BRACELET. 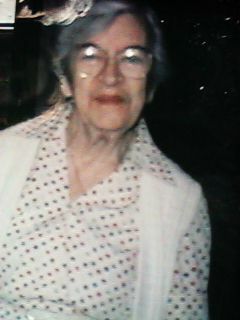 c. 1940s. Double layered plaques with the front design in cut work with the base nielloed. 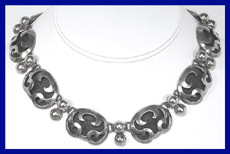 This linked circular design was favored by Senora Brilliant and was renewed in many designs through the decades. 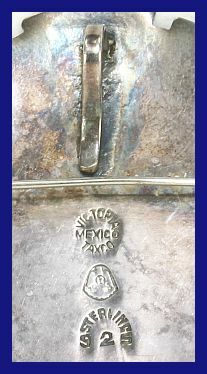 Circular Victoria Taxco Mexico mark, Eagle 12, Sterling, Design #62. 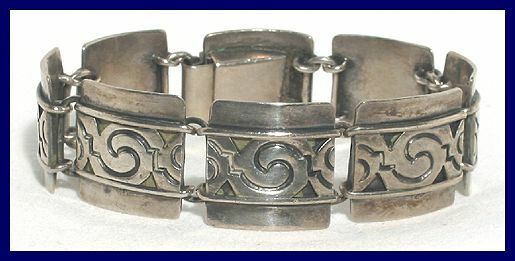 VICTORIA VINTAGE STERLING SILVER BRACELET, Nice early design with a running Aztec motif in the middle of the plaques highlighted in niello. 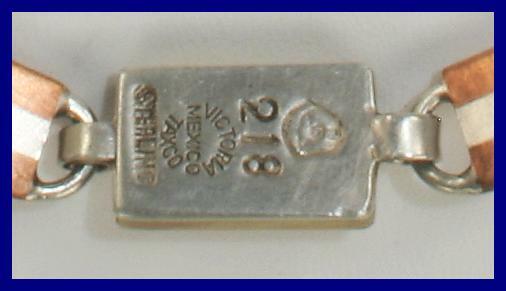 Circular Victoria Taxco Mexico mark, Eagle 12, Sterling, Design #142. VICTORIA VINTAGE STERLING SILVER BROOCH/PENDANT, pre-Columbian Headdress design. Wonderful detail and depth, highlighted with dangle earrings. 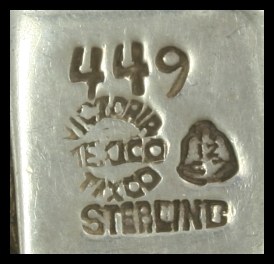 Marked Victoria Taxco Mexico, Sterling 925, Eagle 12. Very Good Condition with a deep, deep patina. VICTORIA VINTAGE STERLING SILVER LOCKET BROOCH, Great old Tree of Life design with Hand Work and Stippling. Large compartment. Marked Victoria Mexico Taxco, design #76, and Eagle 12. Good Condition with a very heavy patina. 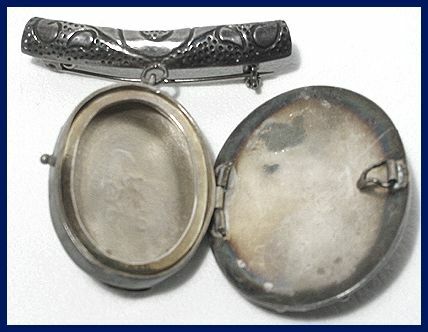 VICTORIA VINTAGE STERLING SILVER GLASS HOLDERS, (Metales Casado (Married Metals). Cutout pre-Columbian warrior faces. Most of the Married Metals of quality happened in the mid-1950s. Marked Victoria, Mexico, and Taxco in a circle, Copper, and Cony, design #305. Each glass holder measures 3-3/4" tall. The Metal is in very good condition, but the metals under the lacquer has some tarnish. Lacquer is removable. 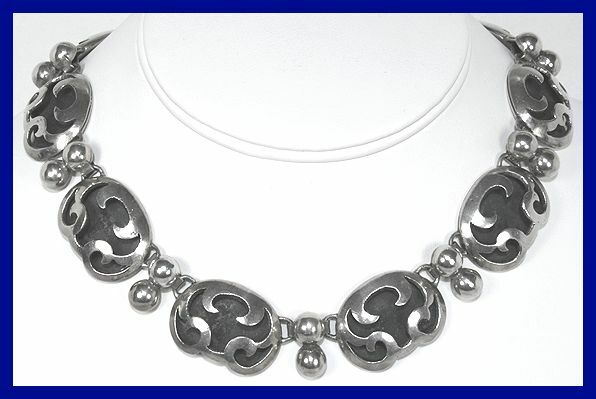 VICTORIA VINTAGE STERLING SILVER NECKLACE 1950s. 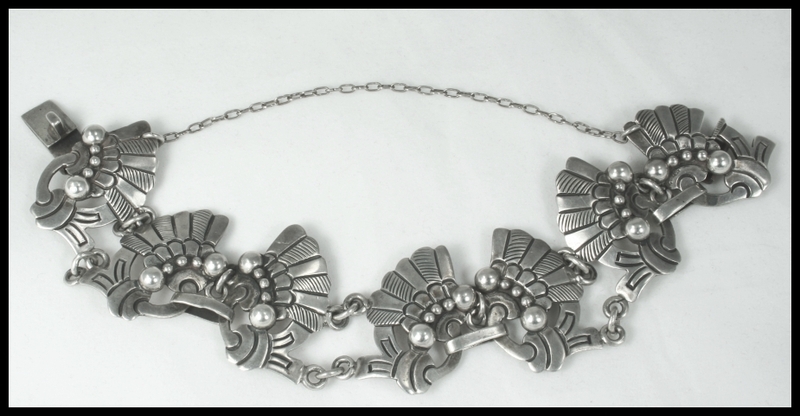 Very intricate, Facing Lilies, designed in Ana Brilanti's innovative Married Metals process. 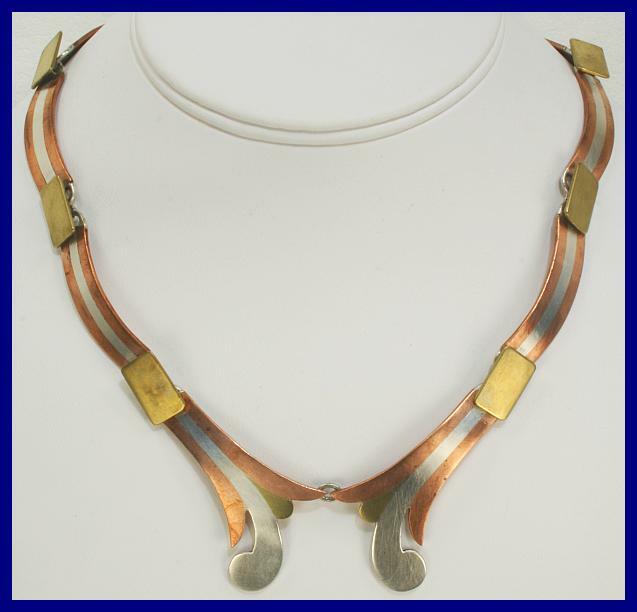 She used Silver, Copper, Tin, or Nickle for Color contrast in her Married Metals. 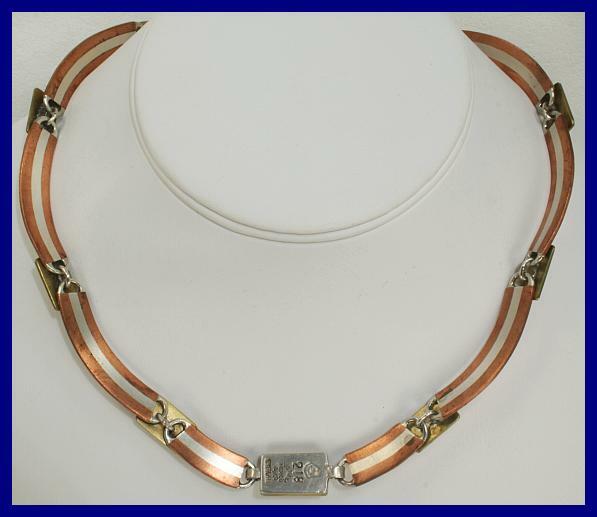 This necklace has Silver, Copper, and Brass. 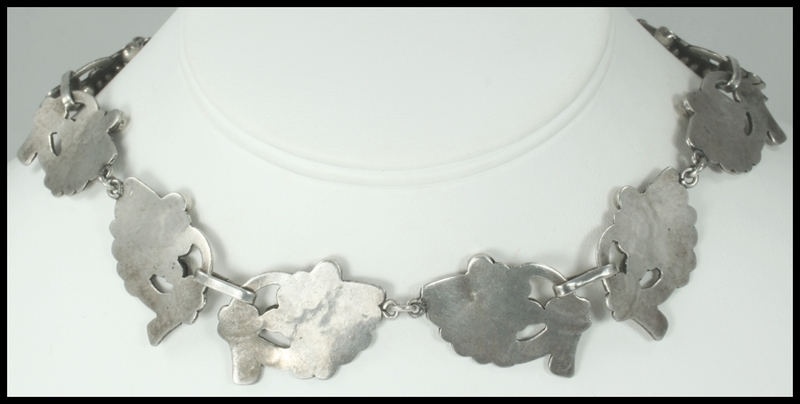 Measures; Necklace 16-1/4". Front centerpiece measures 4" x 1-3/4" approx. VICTORIA VINTAGE STERLING SILVER NECKLACE and Earrings, 1940's, This Large form of the handmade Angel design is one of Ana Brilanti's most popular and enduring designs. Cut out angel forms with a blackened lower layer. Marked Victoria in a circle, design #53. Eagle #12. Measures; Necklace 15" x 3/4", Earrings 1" x 7/8". 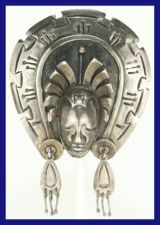 See Brooch #2508, above, for an additional piece in this line.